Hello and happy Friday! You know what I really love? 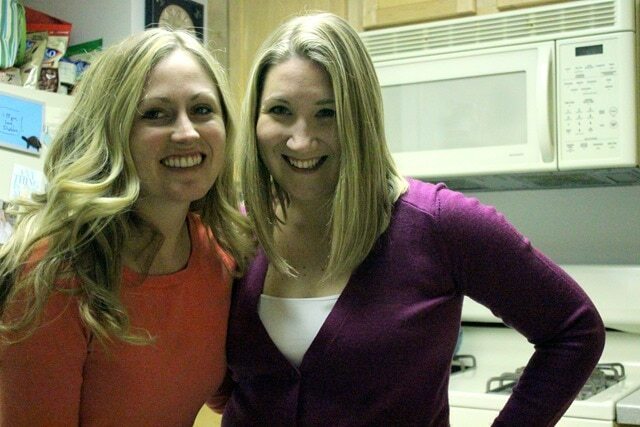 Ingredient potluck dinner dates with friends. My friend Heidi and I had plans to meet up for dinner last night; we originally planned to go out, but we’ve both been eating out a lot lately, so she suggested we cook instead. Save money AND get to play with Zara while making dinner? Perfect. Heidi and I compared the contents of our fridges via text, and decided to do an Asian stir fry. 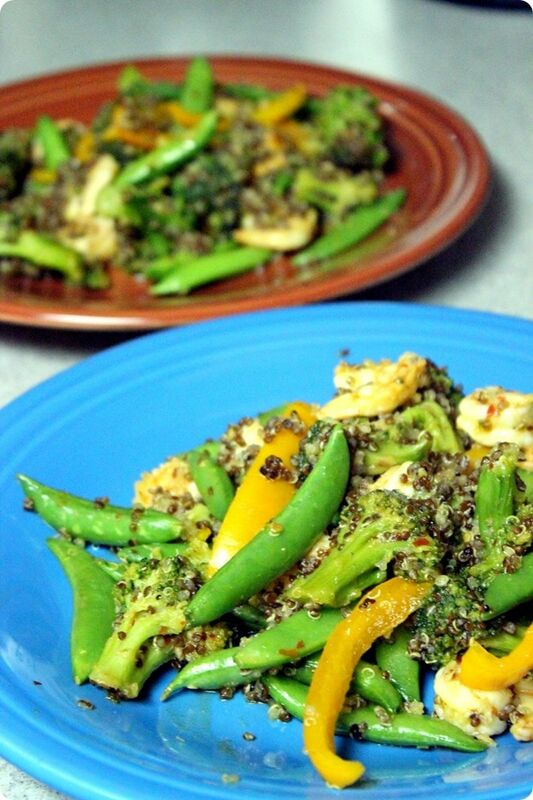 I had snap peas and frozen broccoli on hand, plus some cooked quinoa, and planned to pick up some frozen shrimp. Heidi had a yellow pepper to donate to the cause, and could also bring stuff to make a salad. Sounded good to me! 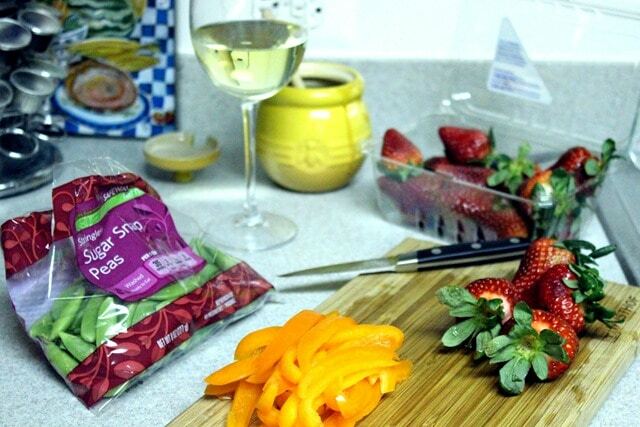 While we chatted and chopped veggies, we also enjoyed some wine. 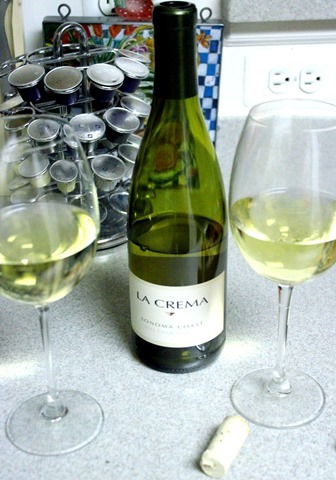 This La Crema Chardonnay is one of my absolute faves. I threw together a quick and easy stir fry sauce before tossing everything into a wok. Here’s the recipe – it’s SO good. Way better than anything bottled. *You can find this online, or in an Asian supermarket, or I picked up a bottle recently from Whole Foods. For the stir fry itself, I threw in the sauce and frozen shrimp first until it started to get pink, then tossed in the frozen broccoli. 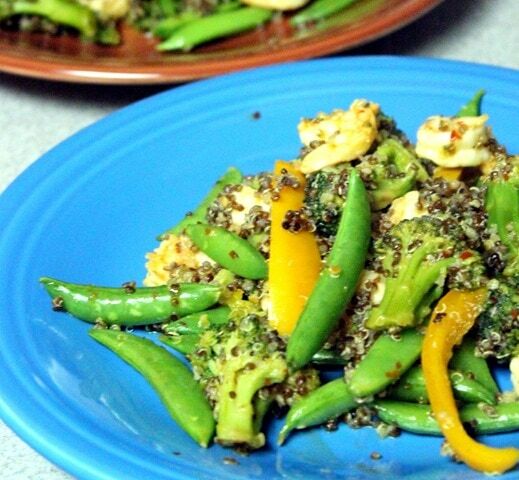 After a couple minutes I threw in the peppers and snap peas, and once it was more or less ready I stirred in some quinoa, since I already had it cooked and ready. Brown rice would work well here, too! Meanwhile, Heidi was preparing our salad. 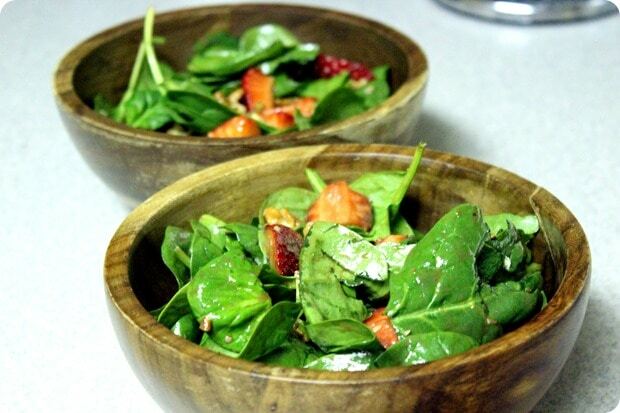 Spinach with strawberries and pecans and walnuts! We knew it didn’t go with the Asian theme, but whatever. It was really tasty! I threw together a simple balsamic vinaigrette dressing (olive oil + balsamic vinegar + dijon mustard + lemon juice) and it was ready to eat. And now, for my weekly workout recap, per request! Since I do these on Fridays, I’ll start adding in the previous Saturday/Sunday, too. Saturday: 1 hour strength & conditioning morning boot camp at NOVA MMA. Love this class – have been going to it on and off for over a year. It’s part of their women’s kickboxing program. Sunday: 13.1 mile marathon training run with my friend Sarah. Tough but fun! Tuesday: 1 hour 15 min evening power yoga class at Edge Yoga. Awesome class. If you haven’t tried one of Mark’s classes there yet, do it. Worth the trip over to VA from DC, I promise. Wednesday: Dark & foggy early a.m. 6 mile run with Mary. And now, back to work. I hope you all have a wonderful day and weekend! I’ve been loving stir fry’s lately! Way to kick a** with your workouts this week! Great job getting in that 3.5 mile run this morning! The food looks yummy, and super easy to make for one person. I am on my own tonight and have all of these on hand so I will more than likely be making this! I need to try this recipe! I’ve been looking at Edge Yoga (not too pricey and the location is great)! Will make a note to get with it and go! The stir-fry looks good! 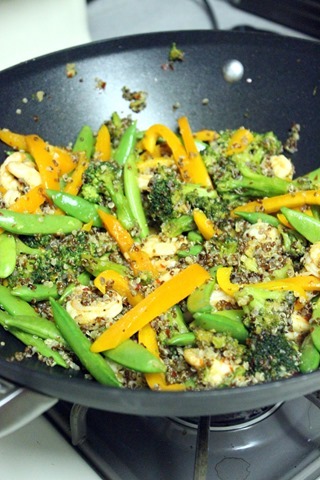 I’ve been determined to make a nice sauce for asian stir-fry and this one looks easy and yummy! The stir fry looks awesome! Nicely done — and well done, also, on the week’s workouts! I totally agree on listening to your body, even if you plan to work out. If you’re really not feeling it and not in a way that going to the gym will make it better (which it often does! ), then skipping a day is what your body needs. Well done! Yeah, exactly. Some days I’m not feeling it… but I’m just being lazy. ;) Monday, on the other hand, was one of those days where I really needed to just hit snooze and give my body a break! Love your running posts and seeing all the DC monuments ! Not sure how you run in the dark. I am scared 1. of falling and 2. for personal security reasons. this is why I get solo excited as the days get longer. Can finally run outside also during the week and not just weekends. Glad you have friends to run with ! La Crema is my FAVORITE Chardonnay. I wish it wasn’t so expensive (It’s $22-$25 in Boston. womp). Last week I took a rest day on Tuesday in favor of sleep, too. I don’t often do that, but I’ve been battling a cold and not resting like I should, so I went for it- it was just what I needed! I know, but it’s so worth it! Hope you’re feeling better soon! I love this! I found your blog researching the Nike Womens’ Half Marathon … A) we have the same shoes and B) I was devastated to find out you have to be over 18 to run that half marathon (oh well I’d probably injure myself for xc). Anyway just wanted to say I’m really loving this blog keep it up!